State-owned airline SAA carried 6.9 million passengers in the year ending March 2016. South African Airways has denied that it has discussed with certain other airlines the possibility of investing in the state-owned airline as part of a process to find a strategic equity partner. Responding to weekend reports, SAA said in a statement that it had, however, met with Emirates, Turkish Airways, Qatar Airways, Kenya Airways, Air Mauritius, United Airlines and Singapore Airlines. Bloomberg reported on Monday that Emirates had ruled out investing in SAA. This is after City Press, citing the UAE’s ambassador to SA, reported on Sunday that both Emirates and Etihad were in talks with SAA about a partnership. "These discussions have been purely about commercial agreements such as interline, codeshare, cargo as well as possibilities of these airlines taking some of our excess flight deck and cabin crew staff. 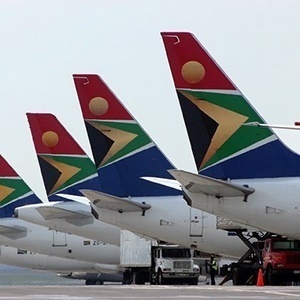 We have not discussed any possibility of them investing in SAA as part of the strategic equity partner process," SAA spokesperson Tlali Tlali said in the statement. "Over the past six months SAA has been on a roadshow to meet its major codeshare partners and other potential commercial partners to revitalise the commercial delivery under the existing agreements and explore mutually beneficial opportunities to expand the network." He said in these meetings with other airlines, SAA also discussed the possibilities of these airlines taking its excess cabin and flight deck crew on a contract basis as part of SAA's turnaround strategy implementation. According to Tlali, SAA is making steady progress in implementing its turnaround plans to lead the airline to financial sustainability. "Network optimisation and development is an important part of the airline’s turnaround strategy. In November, SAA embarked on a network and route rationalisation programme. Part of that programme was the revitalisation of all alliance and partnerships including interline and codeshare agreements," said Tlali. Earlier this month SAA CEO Vuyani Jarana said the airline would "immediately" start looking for a strategic equity partner. Jarana said that, while SAA leadership initially believed the airline should first "get into shape" to make it attractive for potential investors, funding pressures dictated that it should start looking for a strategic equity partner straight away. Jarana told Fin24 that one could not just presume that there would be no private sector interest in the airline before it had succeeded in becoming financially sustainable.